Proudly serving all 52 San Francisco Bay Area cities, towns and villages, Oakland International is the airport closest to home for most of the Bay Area's resident population. It is also the airport closest to most Bay Area businesses and offers superb access to all of the region's top tourism and entertainment venues. The airport is easily accessible and offers air-rail connections from the airport station to the entire BART system and Amtrak's Capital Corridor trains. New routes in 2019 include Southwest Airlines’ first service to Hawaii, to Honolulu and Maui. OAK is proud to have been selected as the gateway for the first flight, and OAK will feature up to 11 daily nonstops to all four Hawaiian islands in Summer 2019. 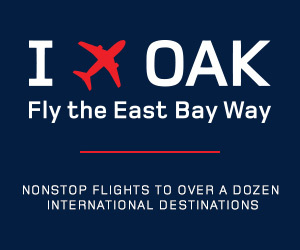 OAK offers nonstops to 64 destinations and is served by Southwest Airlines, Hawaiian Airlines, Norwegian, Delta Air Lines, Alaska Airlines, American Airlines, Boutique Air, Contour Airlines, Spirit Airlines, Allegiant Air, JetBlue Airways, Volaris, and Azores Airlines (seasonally).